It’s that time of year again!! Our Spring trunk show is here! 50% off all frames and $300 off a second complete pair! 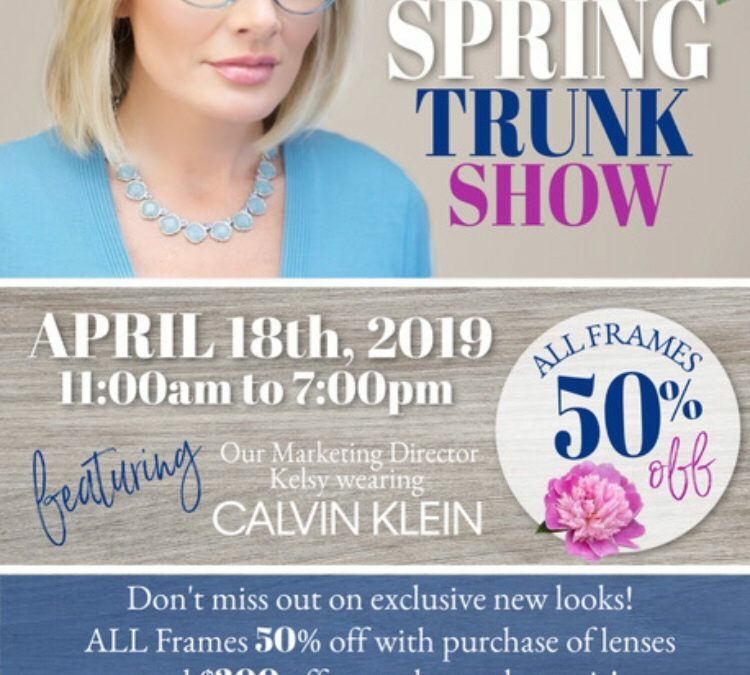 This time we have our rep from Calvin Klein/Diane Von Furstenberg-Kara Holmberg joining us and bringing hundreds of frames that we normally would not have in the clinic. So this is your chance to try on many different colors and styles of frames that you wouldn’t normally have access to. Who doesn’t want a new fresh look coming into Spring and Summer? I know I do! This is a special one day event only! Jennifer Jackson from Chu Vision will be joining us to answer your questions about Cataracts and Lasik surgery. This year we will be providing cookies from Rissa’s Sweet Treats in Waconia! This company has a very special story. The girl who owns it is only 17 years old, but she has been baking and running this business (with the help of her parents) since she was 12. She is an incredibly professional and overachieving young lady! You will not want to miss out on trying her amazing sugar cookies! Tons of raffle and drawing Items. Who wouldn’t want to win a FREE complete pair of glasses? Time: 11am – 7pm. So come on your lunch break to miss the evening rush! We CANNOT wait to see you there! !